Dr. Chow from Western New York Immediate Care will be here every third Saturday at 11:00am through May to talk to parents and answer questions about family health and childhood illnesses. The talks are in the Museum, so your children can play while you get your questions answered and some valuable information about keeping your family healthy! Let’s Get Physical Every Saturday! Join us every Saturday (excluding December 24 & 31) November – March for fun family time in the gym, 11am – 2pm! From Zumba to kids’ yoga, hula hooping to Jump Bunch sports, there’s something to get everyone in the family moving. Let’s Get Physical programs are drop-in, ongoing, and FREE with your admission or membership, thanks to our generous sponsor, BlueCross BlueShield of Western New York. $1 Million Gift Brings Museum Closer to Canalside! Explore & More Children’s Museum recently announced a $1 million capital gift from the Paul A. Saffrin Foundation for the Play It Forward capital campaign to build the new museum at Canalside. With ground breaking set for March, and a planned opening in the second half of 2018, this gift will go toward sponsorship of the Being Good Neighbors educational play zone – one of seven – in the planned facility. 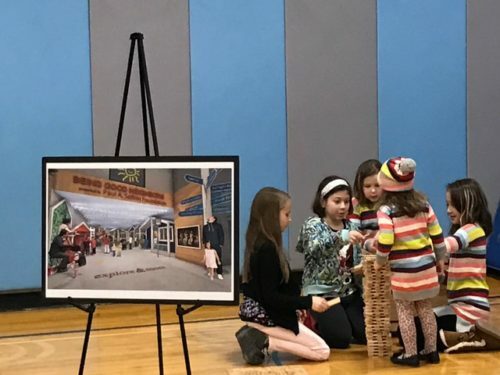 The announcement was made during a program that Explore & More educators facilitated with fourth-grade students at Eggert Road Elementary School. “Those of us fortunate enough to call the City of Good Neighbors our home understand the importance of Being Good Neighbors. I can think of no better legacy to leave my children, and all of our children, than the opportunity to discover the world around them and all of the things that make our hometown special,” said Paul Saffrin, Trustee of the Paul A. Saffrin Foundation. “Every year our students benefit from the hands-on learning experiences that Explore & More provides, either at the Museum or right here in our school. Explore & More’s programs expand on what our students are learning in the classroom, providing a much richer experience through our partnership than what any school can do on its own,” said Terry Tryon, Principal of Eggert Road Elementary in Orchard Park . “Paul Saffrin’s generous gift takes the museum two-thirds of the way to their $27 million project goal. This is a game-changing investment in a once-in-a-lifetime project, which will mean so much for the region’s children today…and for generations to come,” said David McNamara, Managing Partner of Phillips Lytle and Chair of Explore & More’s Capital Campaign. Explore & More Children’s Museum is currently located at 300 Gleed Avenue in East Aurora, and will open in the South Aud Block at Canalside on the Buffalo waterfront in the second half of 2018, after breaking ground in March 2017. 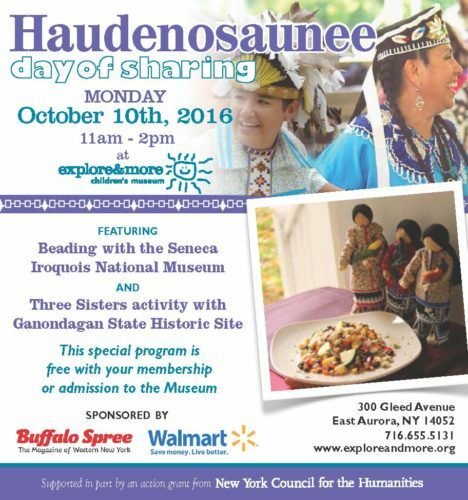 Haudenosaunee Day of Sharing, October 10! Don’t miss our favorite Day of Sharing with our Iroquois friends coming up October 10th. The kids have the day off of school, so bring the whole family and immerse yourself in Haudenosaunee customs, traditions and fun! We will have beading activities with the Seneca-Iroquois National Museum and a Three Sisters activity with the Ganondagan State Historic Site, all from 11am – 2pm. Explore & More is open Monday, October 10th from 10am – 5pm, and this special program is free with your admission! Special thanks to Buffalo Spree and the New York Council for the Humanities for supporting this program. Over 6,000 Students Visited Us With Their Schools This Year! With summer here, we would like to take the time to thank all of the schools and administrators that chose Explore & More for a field trip or program in the 2015-2016 school year! This year, over 6,000 students visited Explore & More in East Aurora for a field trip or workshop. Thanks to the generous donation from the Niagara Frontier Automobile Dealers Association, approximately 2,000 of those students were transported to Explore & More free of charge! This donation has allowed us to reach more children in our community than in previous years and furthered our mission of being accessible to all. In addition to our field trip attendance, Explore & More visited over 50 different schools in Western New York, educating over 5,000 students in their schools. Explore & More presented a variety of programs, including Culture Days which take students on a whirlwind trip around the globe, and Five Senses, a program that encourages children to use their own tools of exploration to experience the world around them! We can’t wait to see everyone again for the 2016-2017 school year. Enjoy your summer!